Meet Mercedes' bread and butter car, the E-Class. It is the German luxury marque's highest selling car, in India and across the world. So, it doesn't come as a surprise that Mercedes has given its ageing model an upgrade so intense (it employs some 2,000 new parts), some even want to term the car 'all-new'. But, of course, it isn't. What it is, though, is a much nicer and younger looking E-Class. We love the new curvaceous and aggressive looking front bumper; we love the new alloy wheel design; and the new headlamps are a job well done too. These replace the quad-lamps which have been an E-Class signature for years but the 'four eye' concept continues thanks to strategically located LED strips inside individual lamps. Mercedes has also re-profiled the bonnet and given the car a more in-your-face grille. 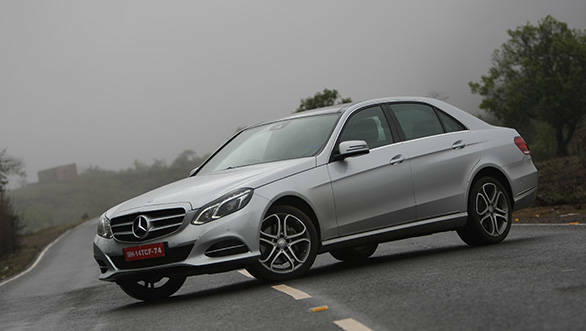 The latter also holds the three-pointed star now, which is a first for an E-Class. The tail lamp and the rear bumper is new, as are the chrome-lined dual tail pipes. Rounding off the exterior changes is a new feature line that runs from the rear doors to the tail lamp to give the car a longer, more elegant stance. Inside, the design hasn't changed much. And that's not altogether a bad thing. The E always had a subtle but elegantly executed and fantastically well put together interior, and that continues in the newer model too. It continues to sport comfortable, sumptuous and supportive seats, front and back, which are in fact among the best in the segment. The airiness of the cabin remains intact and there's still nothing to fault with the car's build quality or fit and finish. The clocks though, have changed and so has the central screen. The COMAND system is upgraded too; it incorporates satellite navigation and a DVD player now. The equipment list is as comprehensive as ever. On the safety end, besides ESP, ASR, ABS and eight airbags, the E for the first time gets full LED headlamps along with adaptive lighting. Pre-safe, Mercedes' protection program, which tightens the seat belts, uprights the seating position and closes windows and the sunroof when the car's numerous sensors are sure the car is going to crash, is standard on the car as well. On the comfort and convenience end, there's a multi-zone climate control system, electrically adjustable front seats and steering wheel, a detailed trip computer, decent storage areas, Bluetooth telephony and a panoramic sunroof. The top of the line E-Class we are driving also gets Park Assist. Park Assist helps the driver locate a suitable spot for parking and then guides him into the space in a step-by-step manoeuvre. We tried this feature and must say it isn't the best in the business. Firstly, there's no separate button to get it to work. If you drive under 30kmph and the car spots a parking space, it gets activated automatically which is indicated by a tiny arrow next to the P button. The E then needs to be aligned with the cars already parked following which, the car's instructions begin. Also, the car only works the steering so the throttle and brake still need to be controlled by the driver. We have seen such a system in India before - on the Volkswagen Passat - and we prefer the functioning and usability of this system over the Mercedes'. The car we are driving is the diesel E 250 CDI. 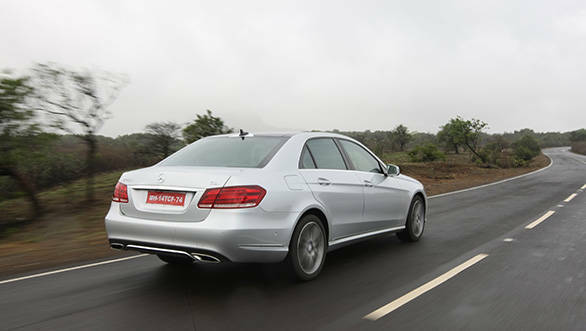 Yes, this 2.1-litre, 204PS, four cylinder version will be the range topper among diesels instead of the 3-litre, V6 E350 CDI the current model was launched with. Mercedes has since discontinued the 350 CDI and says it might look at the 350 CDI for the new model in the future, but as of now there are no confirmed plans. This four-cylinder engine is the same engine that does duty on the current E and C-Class 250 CDI versions. It isn't the most refined or smooth engine in its class. Not that you can hear much of the engine inside, but the clatter is quite audible on the outside. And that's never a good thing for luxury cars. 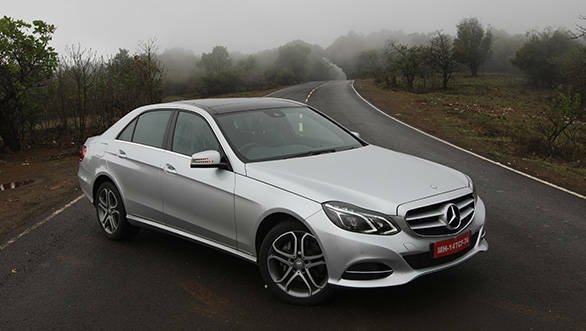 As expected, the 250 CDI mated to the seven-speed torque convertor automatic, is no scorcher. It takes 8 .5 seconds to complete the 0-100kmph run while the quarter mile is achieved in 16.1 seconds. The top speed for the car is a claimed 242 kmph. We are no fans of this particular gearbox from Mercedes for it is slow in its responses and does little to keep the enthusiastic driver involved. But even then, a time of 6.5 seconds for the 40-100kmph kickdown is quite respectable; no wonder our overtaking moves within the city and out on the highway weren't exactly harrowing. This was, however, true when we drove in Sport mode. In the Economy mode - the only other setting the gearbox offers apart from Sport - getting gently on the throttle did nothing. The car sat in the same gear and it took its own sweet time to get up to speed. Stamping on the throttle yielded better results. But again, the downshifts take a tad longer than what is the norm in the segment. Mercedes says, the idea of sticking with the four cylinder engine, gearbox and tech like stop/start is to achieve much better fuel economy. We got 17.1kmpl on the highway and 10.4kmpl in the city. These figures are an improvement over the current car, but aren't exactly breathtaking. The E 250 CDI isn't a dynamic car to drive either. The steering is light and cold. The rack is quick and precise but the involvement levels are low. Also, the car isn't very happy or alert to go dancing around corners. It rolls, and if the corner is bumpy or undulating, there's a fair bit of wallowing to be dealt with as well. Being rear wheel drive, you'd think it would be happy to oversteer and add to the fun factor somewhat, but it doesn't; its first reaction to any steering input is to understeer. That, however, isn't a problem because the E-Class was never engineered to be a fantastically involving driver's car in the first place. It is a car designed for comfort and luxury. And it shows in the way it powers up. The power delivery is smooth, which owners who are driven more often, will appreciate no end. It also rides well  there's a bit of noise and a few thuds that creep in at slower speeds over pronounced bumps, but it never feels uncomfortable. However, as speed increases, the ride settles down beautifully  the noise and vibrations reduce and the suspension's absorption ability improves significantly as well. In fact, the E is a great car to take the rough at a fairly high clip. The suspension architecture on the new E isn't revolutionary, with the car employing a multi-link layout. However, the technology used for damping certainly deserves mention. Mercedes uses what it calls Agility Control on the E. This is a stroke dependent damping system which firms up the damping during hard body movement to improve cornering and softens the damping characteristics at slower speeds to improve the ride quality. This is employed in their Luxury models. The same hardware, but with slightly stiffer setting, is used on the Sport versions, while the AMG versions use completely different adaptive suspension. Our car ran the Luxury setting which, given our roads, is the right way to go. So there you have it  Mercedes has done a wonderful job in upgrading the E-Class' looks; it looks younger and more aggressive now. It also retains its virtues like the well-built, well specced, spacious and luxurious cabin. The seats are large and comfortable and along with good visibility and light controls, it continues to be an easy car to drive. So, is it then the game changer we thought it might be? No. Does it at least redefine the rules of the segment so as to get the competition worried? No, again. 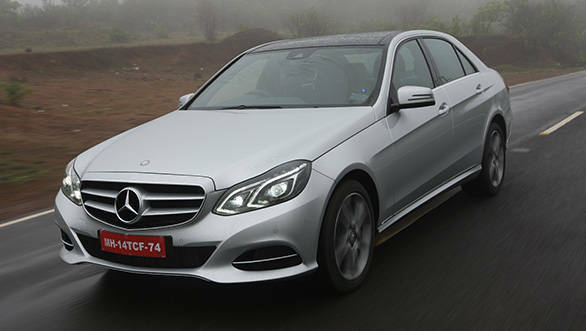 But, it is the right step forward for Mercedes and the E-Class, no doubt about that. More importantly, this new car will continue to please the E-Class loyalists and it has the potential to attract quite a few from rival camps as well.